In 2013, Google’s revenue were larger than the Gross Domestic Product of the Dominican Republic. With annual revenues of $59.8 billion dollars and coming off of a 22% year on year growth, the powerhouse is the final word in internet advertising and searching. Not bad for a company that only moved out of its garage office in 1999, with only 8 employees. Google’s success is the stuff of legends. And like any real legend, anyone can learn from their success. Yes, even logistics companies. So what can freight and logistics companies learn from Google? When you forward this article to your friend, you’re most likely going to use Gmail, the web’s most popular email client. 70% of the top US universities and 45 out of the 50 US states use Google Apps. As a matter of fact, the idea of getting a free gigabyte of storage space was so incredible when Gmail launched (on April 1st), that for days everyone thought it was a practical joke. But just like Google Search, Calendar and any other Google product, Google applications work fast and well. It’s easy, it’s simple and it kills the competition. When a customer calls up for a price quote, what is the experience like? RFPs and tariffs can be a nightmare for shippers who just want to move goods as fast and cheap as possible. Compare your experience to the express shipping experience. Can your customers log in to your website, get an instant price quote and book a shipment? Does your TMS support automated quoting? How long does it take for you to quote if you need to call an agent? Google proved that technology can be harnessed to work for the end user. And if you aren’t going it, someone else may be…and they will beat out companies that aren’t . Trust me, rapid quote turnaround will increase your win-rate by 5%. What does that mean? 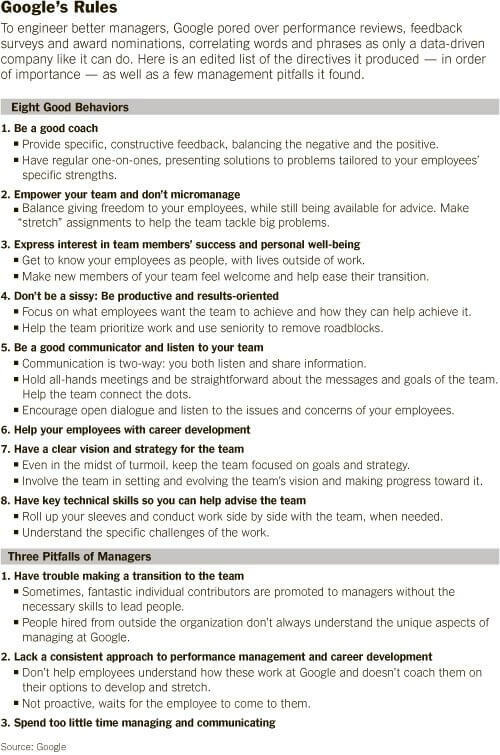 That a good manager helps out…but a really good manager sets the stage for his team to achieve greatness and then takes a step back. 3. There’s information out there. Use it. 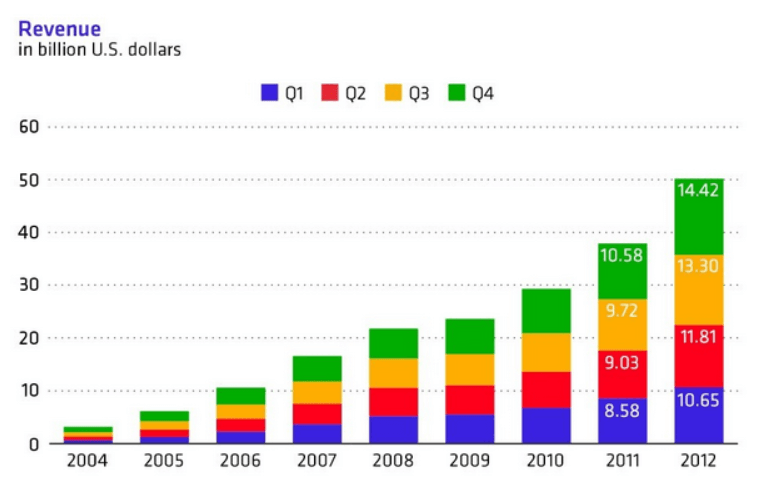 Google makes over 95% of its billions of dollars of revenue off advertising. And the reason it works so well is that Google knows so much about the people who are searching. Complicated alogorithims can put together the puzzle pieces of which YouTube videos you’re watching to what subjects your emails are about, it can use your searches for context (searching for “club” right after you searched for “golf” would be different than searching for it right after “party”) and more. The constant changes on its homepage are even the byproduct of A/B testing; testing multiple versions of the same page out with millions of different users to see results. Do you know what’s happening inside your operations? Who is your best sales person, most profitable office, most popular shipping route, fastest growing client or any of the other thousand questions you need to know? Big freight companies means big data, and big data means that there are insights you may be missing out on. Grab a business intelligence solution that can give you a bird’s eye view into your quoting and see what you can learn! Ever hear about Google X? No, it’s not an X-Men sequel. Google X is Google’s private innovation lab that is dedicated to thinking different. As a matter of fact, the job title of the lab’s head is “Captain of Moonshot”. Unlike the online software that is probably your only interaction with Google, Google X makes real stuff – Google Glass glasses, driverless cars, Wi-Fi balloons and more. Yep, Google Drive might be more of a voice command than an online platform one day. That’s an entire department focused on looking at what everyone thinks is impossible and flipping it on its head. Change norms. 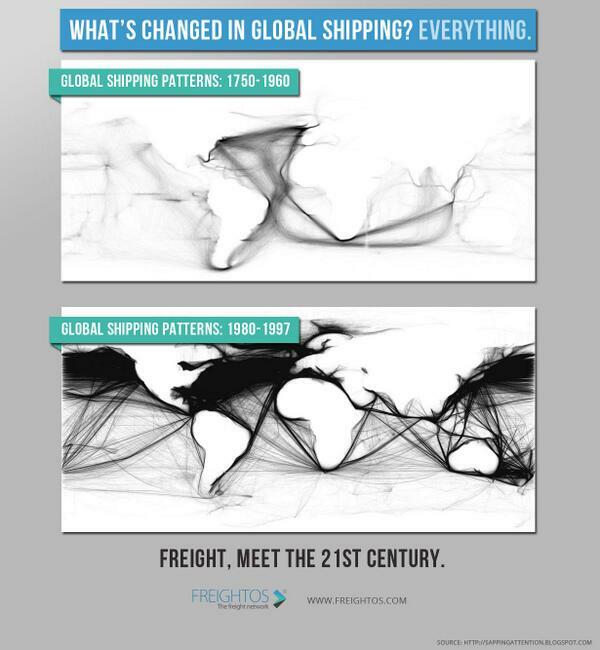 Shipping is one of the oldest professions in the books but just because you’ve been doing things the same for years doesn’t mean you need to keep it going. Still getting used to Excel spreadsheet quoting? That doesn’t mean you can’t check out faster options! Love your 16 wheelers? You’ll love them even more on natural gas. Technology is changing fast – iPhones have only been around for 7 years. Don’t miss the boat because you’re used to the port! Google has, over almost two decades, cultivated a great personality. Best example? Have you ever clicked the “I’m feeling lucky” button on the homepage? When you click it, that button takes you to the first search result. Which means that Google, which makes over 95% of its profit off of ads (yep, we mentioned that already), is letting you skip its own ads, just because people like it there. Some estimate that Google is losing out on $110 million every year, just to keep the button! The bottom line is important…but it’s not only about the bottom line. Happy employees and happy customers will, down the line, mean a happier bottom line anyways. Maersk LEGO sets aren’t just great branding, it’s a way to make a container ship an idea, not just a big boat. When we were designing our offices, we wanted to show off that we were involved in freight, not hide it under the table. Which is why we made sure that our furniture was pallet-heavy. And everyone loves our couches. 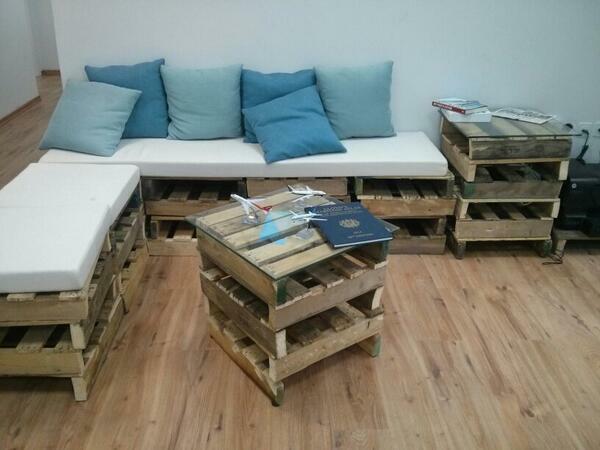 We love our pallet couches and coffee table! Ready for instant freight quotes? Instantly compare international freight quotes. Happy holidays.